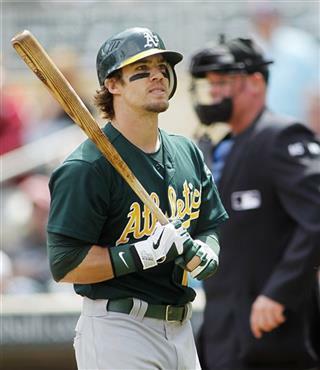 The Mets traded Minor Leaguer Jefry Marte to the Oakland A’s for Collin Cowgill, who is a human outfielder that bats right-handed and thus a massive upgrade to their roster. It’s actually a good deal for a number of reasons: Though Cowgill’s 75 career OPS+ won’t turn many heads, he’s posted a strong .298/.379/405 line against lefties in a tiny sample in the Majors and a .281/.330/.536 line against them over the past two seasons at Triple-A. He plays all three outfield positions and supposedly had a good arm, he always hit pretty well in the Minors — though he was a bit old for every level — he stole bases in the Minors at a Beltranian rate, and he’ll be under team control for the next five years if it comes to that. Unless the Mets sign multiple righty-hitting outfielders, Cowgill’s likely to make the big club out of Spring Training. That latter stigma is the one that has been attached to the fiery Cowgill, 25, for so long. Standing just 5-foot-9, Cowgill has been a victim of his stature, and perhaps his own intensity. He has gotten labeled gritty — perhaps even an overachiever — but he could be the next Eric Byrnes with speed and pop. Cowgill, perhaps because the scouts don’t tend to be fans of grit and any outfielder under 6-feet, is flying well under the radar in fantasy. Just this week, he was finally owned in at least one percent of CBSSports.com’s leagues. The story about a potential call-up has ticked him up to 3 percent. Wait, since when are scouts not fans of grit? Cowgill’s going to have to be really good for that type of talk not to become infuriating. But hey, at least he does all the little things. Plays the game the right way. Gives his heart and soul every day.